CANCELLED for Monday Mar 19, Mar 26 and Apr 2. Start your week off with focus and mindfulness. 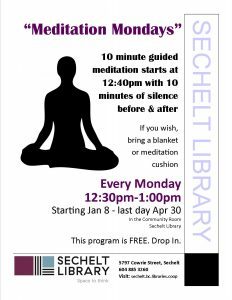 A 10 minute guided meditation will be offered at precisely 12:40pm. Doors open at 12:30pm, and you are welcome to stay until 1:00pm, to sit in contemplative silence. Starts Monday, January 8, running until Monday April 30, 2018, with exception of Spring Break and Easter: March 20, 27, April 2. Visit Sechelt Public Library’s profile on Pinterest.